I love blue nail polishes. Can't help myself. I love the fact that different tones of blues can be so suited to different months, and even the slightest variation somehow becomes a totally different nail colour which is suited to different occasions and looks. Essie is a great brand for blues, which my old favourite Lapiz of Luxury comes from (also, look at all the other blues in their range!). With the release of the SS15 range however, this absolutely has been replaced by my new love, Saltwater Happy. Saltwater Happy is what I would describe as a pale and pretty periwinkle blue, but with a slightly grey-white undertone, that makes it look vaguely washed out, but in a good way. It makes me think of washed-in denim, and still looks warm despite the undertone, and I think it would look really nice on if you have a tan or not. 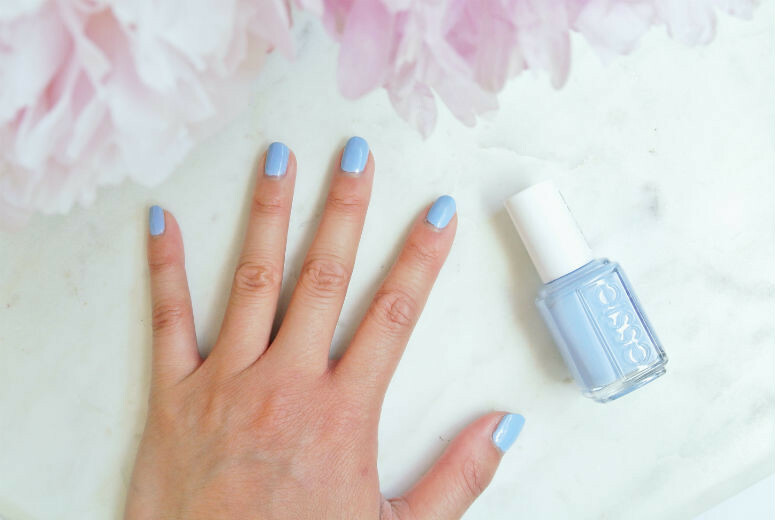 If you have Essie Bikini So Teeny, you might pass on this colour, but I think Saltwater Happy is a much prettier colour. It looks very chic on, and I would say looks a touch more elegant than Bikini So Teeny on me. Some Essie polishes can be on the thin side, but this one is slightly thicker than some I like (Meet Me At Sunset, I'm looking at you) to the point that some people might be able to make do with just one coat. I used two however to reach complete full opacity. I did contemplate buying some of the other colours in the SS15 range, especially because the two different stores I tried for Saltwater Happy didn't have it, but I stuck out and decided just to get this one, and I'm more than happy with that decision. The other colours in the range are really pretty, don't get me wrong, but this is the only one that really hit the spot for me. A definite win I'd say. I can see myself wearing this one constantly this summer! I picked mine up eventually at my local Boots, but I also found other shades in this particular collection in Superdrugs.